2-6 nights fishing adventure – 2 Night Territory Fish-a-thon A golden snapper from the Tiwi IslandsEver dreamed of a fish-a-thon in the tropical waters off the coast of the Northern Territory? Well here it is – easy and accessible from the modern city of Darwin; this unforgettable fishing charter departs at 6pm in the evening and returns 2 Days later. 3 Night Classic Top End Fishing Adventure What a catch! A massive cod. Fish Darwin’s signature charter, this 3 Day Fishing Adventure allows keen fishermen the time to chase bottom dwellers, pelagics and sport fish. You’ll enjoy world class fishing and by departing at 6pm the night before we do most of the travel time at night to areas such as the Peron Islands, Flat Top Banks or the Tiwi Islands. Grab your mates for an unforgettable fishing experience. 4 Night Fishing Extreme Jewies all round!For those keen to get the most of their time in the tropical waters of Northern Australia, this extreme fishing charter allows time to travel even further to the more remote fishing grounds such as: Flat Top Banks Tiwi Islands or around the Perons, Cape Ford and Cape Scott There is time to hunt many species with world class results – don’t miss the opportunity! 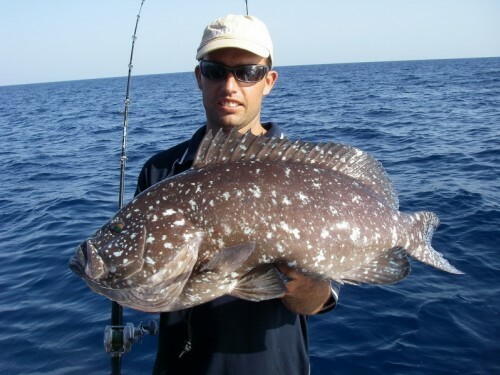 5 Night Fanatical Fishing Safari Beautiful red emperor at night!Looking for the ultimate in reef and sport fishing? This 5 Night Charter travels to the most remote Territory fishing grounds accessible from Darwin. You’ll have the time to experience world class bottom fishing, pelagic fishing and sport fishing whilst still able to relax, unwind and truly enjoy the tropical waters of the Top End. Reef and Sport fishing at its best! 6 Night Ultimate Barra and Reef Fishing Safari .Interested in trying your hand at the famous barramundi fishing of the Northern Territory? But also love the variety of blue water fishing with bottom dwellers, pelagic fish and sports fish? 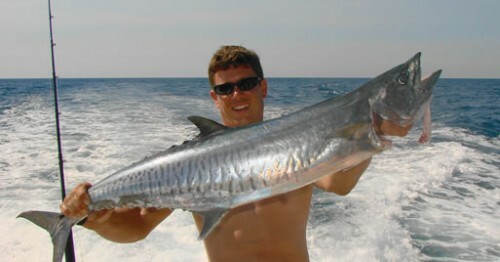 Then this charter is perfect for you with 3 Nights Barra Fishing, a night off in Darwin, and then 3 Nights Reef Fishing. This is a dream fishing safari – with a bit of everything! 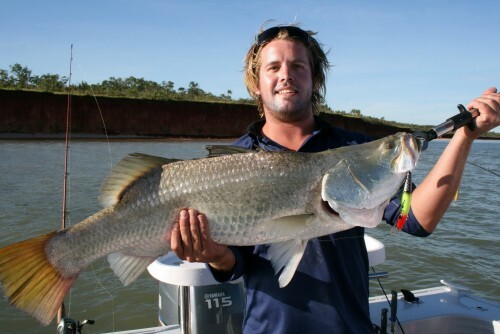 With something for everyone, this 6 Night Charter is the ultimate in Northern Territory Fishing. Available for up to 6 people, we spend the first 3 nights on the 46 foot boat Northern Exile targeting blue water and sport fishing species. We return to Darwin where you have a night and day to explore and relax before departing for another 3 nights fishing. For these next 3 nights we use Northern Exile as a mothership, towing tenders in which to fish the creeks and rivers for the elusive and infamous barramundi. Depart Darwin from the Cullen Bay Ferry Terminal at 6pm. Sit back, relax and enjoy the sunset and tropical night as we steam to one of many remote fishing destinations in the Top End. Owner, Shaun Uden, has many years experience and plans the charters meticulously for the best fishing action. Your crew will introduce you to your new home for the nights, Northern Exile, and prepare sunset nibbles and dinner for you as we make our way to the fishing destination. Northern Exile is a 46 foot Westcoaster that has a large back fishing deck with plenty of space, shade, rod holders and seating. Inside is an air-conditioned saloon area, basic air-conditioned bunk and camp bed style accommodation and a separate bathroom with freshwater shower and flushing toilet. The itinerary is open as it will change from trip to trip depending on the destination, your interests and the best fishing action. But as a rule, we’ll move about the reefs, shoals and drop offs fishing for different species around the different tidal movements. Common species are golden snapper, Spanish mackerel, red emperor, coral trout, long tail tuna, giant and golden trevally, queenfish, blue salmon, chinamen fish, mangrove jack and more. Some less common species that we regularly come across are long nosed emperor, rankin cod, red bass, moari bass, spangled emperor, golden spotted cod and more.Many charters record over 30 species of fish brought on board. We only use the best fishing gear and tackle, with a mixture of Shimano, Penn and Daiwa Reels and Ugly Stick rods. These are all provided for your use along with delicious meals prepared for you each day by your crew. A mixture of bacon, egg, toast, cereal and fruit breakfasts, cold meat and salad or BBQ lunches and sunset nibbles with BBQ and salad dinners. We have lots of snacks on board and plenty of iced drinking water and hot drinks. Remember: Don’t forget your hat, sunglasses, long sleeve shirt, camera and video (power is available to recharge batteries) BYO alcohol and soft drinks – a large esky is available for your use. (Please note that responsible drinking is a requirement on these charters). Fish Darwin is locally owned and operated, specialising in a range of tours from half a day in Darwin Harbour to two, three, four, five and six night Live-a-Board Charters across the Top End. We are passionate about fishing and our customers are our Number 1 priority. We want to provide all our customers with an adventure that they’ll never forget. Northern Territory fishing will see you hook up a variety of delicious and hard fighting species from fishing hotpots with a multitude of tropical reefs, shoals, islands and historic wrecks.